Senior Health Fair Reviewed by Edgeville Buzz on March 16, 2011 . – Would you like to find out more about services available to older adults? – Do you have a question about your electric or gas bill? – Want to know where to find a free Tai Chi class? – Do you need your blood pressure or glucose level checked ? 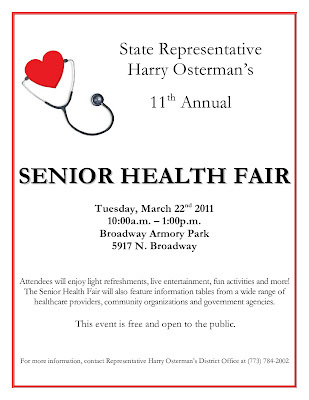 If so, then please come to State Representative Harry Osterman’s 11th annual Senior Fair on Tuesday March 22, 10am – 1pm at the Broadway Armory, 5917 N. Broadway (at Thorndale Ave.). Over 45 representatives of various agencies will be available so you can learn more about their services and get your questions answered. These agencies include healthcare providers, government agencies, utilities and various nonprofits such as the Chicago Dept. of Family & Support Services, ComEd, Peoples Gas, Weiss Hospital, IL Attorney General’s Office, Chicago Transit Authority, AARP, White Crane Wellness Center and many more. 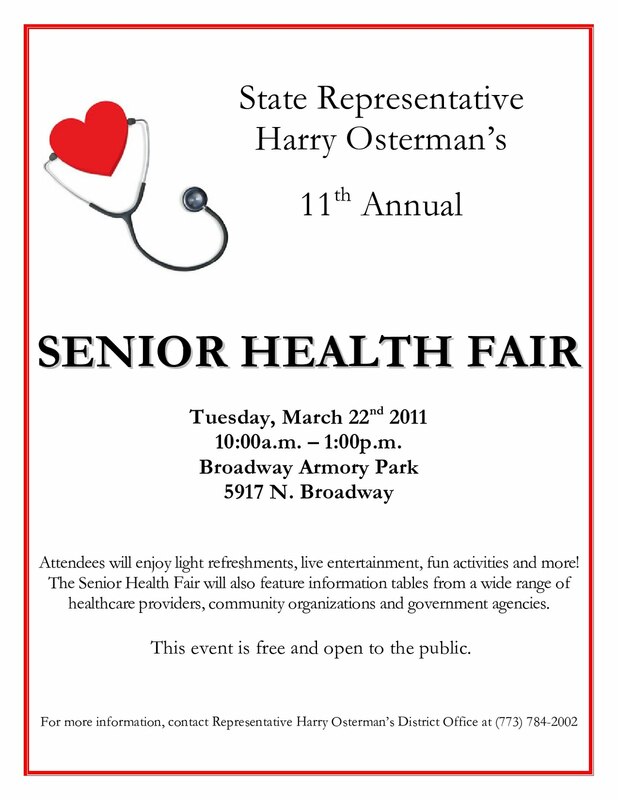 Free health screenings will be available. At the IL Secretary of State’s Mobile Unit you will be able to renew your driver’s license or get a state ID. You will also enjoy light refreshments, live entertainment, bingo and a gift bag! This event if free and open to the public.